Google Spreadsheets is an extremely popular way to create and edit tables online because of its advanced functionality. It’s free, it does not require installing any software on a client’s computer, it supports importing data from popular office software programs, and it stores all the data online. We could not of course ignore this format, so with version 1.6 wpDataTables now supports Google Spreadsheets as an input data source. 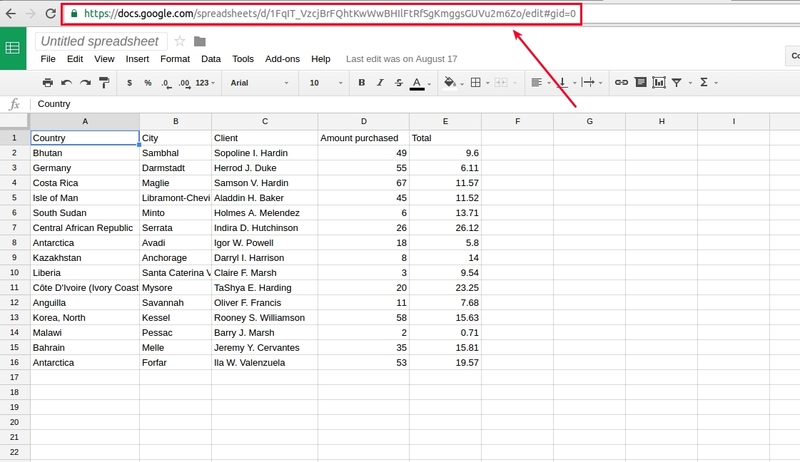 See this example (published Google spreadsheet), and the table rendered from this Google Spreadsheet below. The step-by-step tutorial on creating wpDataTables from Google Spreadsheets is below the table. are highly not recommended, because the old table will not work, at the moment. If you make any of these changes, please recreate the table again. Ebony Rivas Erat Corp. Dudzele nulla. In tincidunt congue turpis. In condimentum. Donec at arcu. Chantale Petersen Nonummy Ac Company College luctus et ultrices posuere cubilia Curae; Phasellus ornare. Fusce mollis. John Cunningham Penatibus Et Magnis Foundation Ammanford et, euismod et, commodo at, libero. Morbi accumsan laoreet ipsum. Blythe Cherry Maecenas Mi Ltd Tavistock nisi nibh lacinia orci, consectetuer euismod est arcu ac orci. Garth Petty Eu Ligula Incorporated Diyarbakır tellus, imperdiet non, vestibulum nec, euismod in, dolor. Fusce feugiat. Jeremy Raymond Nisl Sem Consequat Ltd Meux iaculis odio. Nam interdum enim non nisi. Aenean eget metus. Aladdin Harding Turpis Non Enim LLC High Level ipsum. Donec sollicitudin adipiscing ligula. Aenean gravida nunc sed pede. Sylvia Rojas Et Corporation Lige tempus mauris erat eget ipsum. Suspendisse sagittis. Nullam vitae diam. Ebony Carey Laoreet Lectus Inc. Tomaszów Mazowiecki arcu et pede. Nunc sed orci lobortis augue scelerisque mollis. Lisandra Douglas Ultrices Iaculis Odio Institute Enns ligula. Aenean euismod mauris eu elit. Nulla facilisi. Sed neque. Karen Munoz Placerat Orci Consulting Oppido Mamertina imperdiet ornare. In faucibus. Morbi vehicula. Pellentesque tincidunt tempus risus. 1. The data is read from the data source every time the page loads, so when your tables are large (more then 2000-3000 cells) this source won’t be the right choice since the page with large tables will load slow, or even crash after reaching a certain size. 2. There is a cache on the Google side, so when you update the table it might take up to 5-15 minutes to be reflected in wpDataTable. 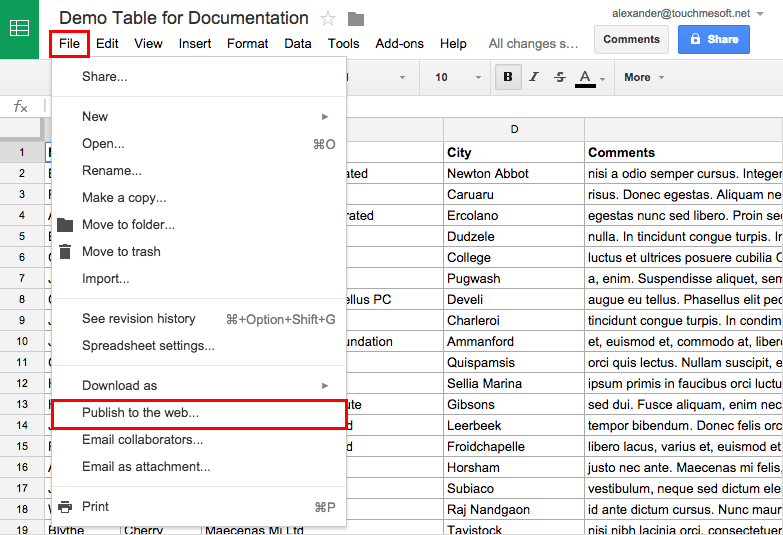 Open Google Spreadsheets, find the spreadsheet you would like to use in wpDataTables; or create one. 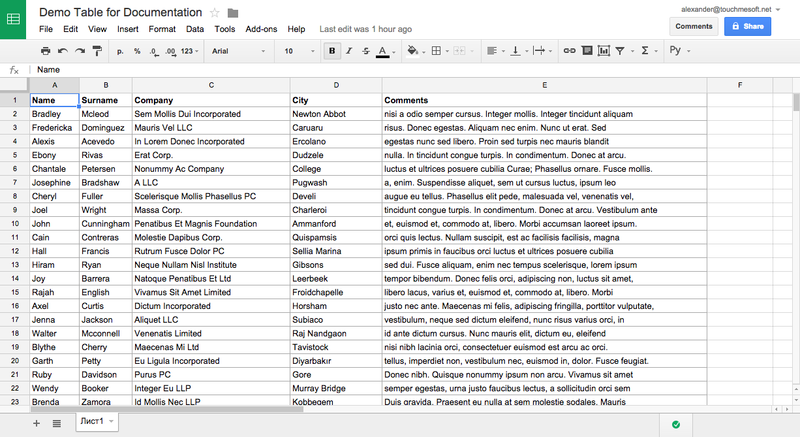 Once you’ve opened the Google Spreadsheets editing mode, you can enter the data that you need. Alternatively, you can copy&paste the table data from your favorite software – e.g., MS Excel, Numbers, or LibreOffice. Data is auto-saved on the Google Spreadsheets side whenever you change it, but to be able to use it in wpDataTables you first need to publish it. 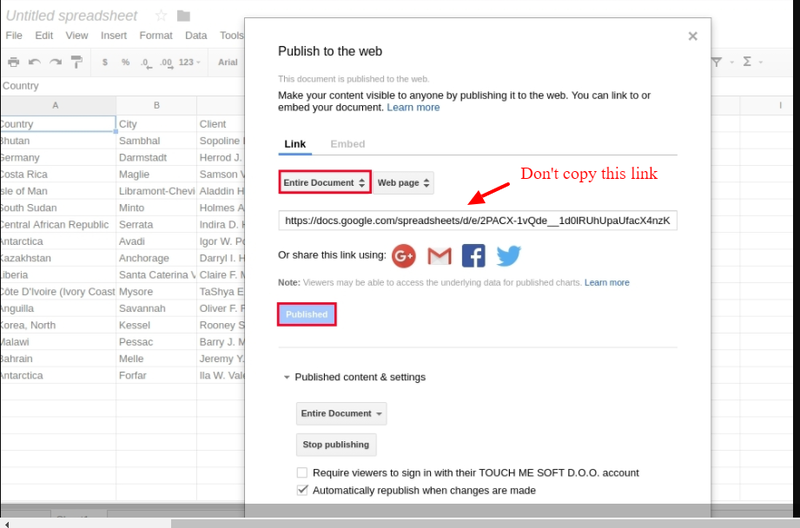 then choose Entire document, and click Publish to get the link. Note: Please, don’t copy the link that is first shown in Publish section. Instead, copy this link from your browser, since you will use it in wpDataTables (the links aren’t same, and with the first one you will not be able to create the table). Keep in mind that wpDataTables doesn’t support Google Spreadsheet with merged cells. Also, don’t apply any formatting in this new sheet. You can make whatever adjustment you may need in WpDataTables. 1. Go to wpDataTables -> Create a Table, and choose Create a table linked to an existing data source option. 2. Set a name for your new wpDataTable to help you to find the table later. 3. 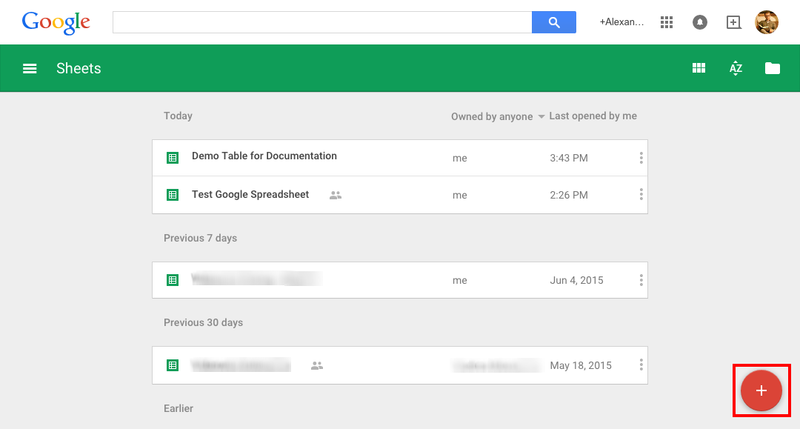 Choose Google Spreadsheet as the Input data source type. 4. Paste the spreadsheet link that you copied in step 1 to the Input file or URL input field. Once you do this, click “Apply“. wpDataTables will read the table content and columns structure, and try to guess the column data types. When a wpDataTable is created, you can use it in a post or page. Create a post or page, or open a post/page that you already have for editing. As an alternative, you can simply copy & paste the generated wpDataTable shortcode. When you save the post or page, and open it in the front-end, you will see the wpDataTable with the data from your Google Spreadsheet.